RPM Lever Pound stock yards allow operators to work animals from an elevated platform. This gives them a clear and unimpeded view of the animals and, as a result, helps to improve ‘on farm’ OHS. RPM Lever Pound stock yards also feature multiple drafting options. There is a simple, quick and effective locking mechanism for each gate. These stock yards are compatible with RPM yard systems. They are made from sturdy galvanized Oval Rail, which is sheeted with 2mm black poly. 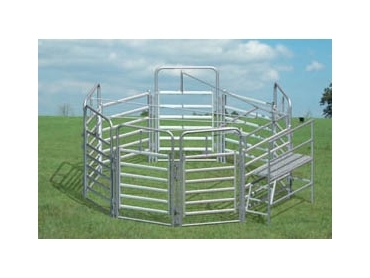 RPM Rural Products offer a highly respected brand of livestock and rural equipment. All their products offer quality, value and reliability. In addition, they are supported by a comprehensive customer service offering.